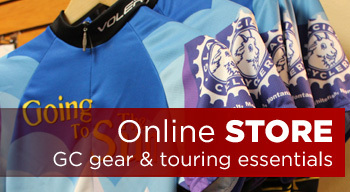 Welcome to Glacier Cyclery & Nordic, where we sell more than bikes, skis and gear, we sell a good time! During the summer, we’re outfitting the local cycling community and travelers with bikes and everything needed for fun days of riding. During the winter, there’s no hibernation period…Glacier Cyclery & Nordic becomes the place to go to for cross country skiers. The shop transforms into the Flathead Valley’s premiere Nordic store with an ideal location in downtown Whitefish, just one mile from the Glacier Nordic Center ski trails. Glacier Cyclery & Nordic offers a variety of classic and skate ski packages so you can have the best possible experience no matter your ability level or ski destination. All skis are lovingly waxed and maintained between rentals to ensure good glide and control. Give us a call at 406-862-6446 or stop by the store. Our knowledgeable staff can help pick the appropriate ski (length, width, type), boot and pole for your next ski excursion. All rental packages include skis, boots and poles. *HALF DAY is any 4 hours, or pick up after 5pm and return at 10am the next morning. **FULL DAY is a 24-hour rental. 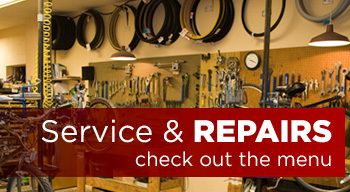 Over 37 years ago, Glacier Cyclery began its life as a service only bike repair shop. Through the years, Glacier Cyclery & Nordic has grown to be one of the largest bike and cross country ski shops in the wonderful state of Montana. However, our roots are still founded in service and we pride ourselves on being one of the best equipped, well staffed, most capable service shops under the stars, and that includes helping you maintain your winter gear for the best cross country and skate ski experience. The “whole enchilada” of ski tunes! An additional cold or moly layer is added to the Basic Glide service for a more static and dirt resistant, durable, faster ski. *Ask about our additional tuning items, such as Fast Skis service, Race Prep, and Pine Tar treatments. *Binding mount is included with any new ski package purchase. The correct skis, boots and gear will keep you comfortable and confident on the snow, so that you can pay attention to the scenery and focus on having fun. At Glacier Cyclery & Nordic, we listen to what type of Nordic skiing you are considering and ask you questions that will help steer you to the right equipment. 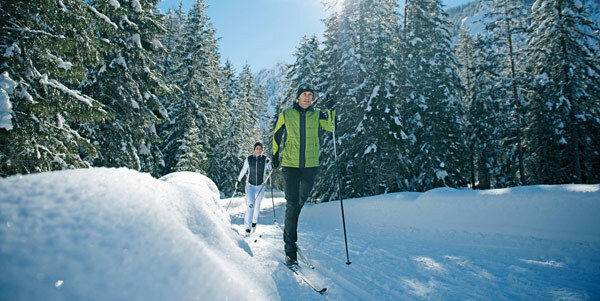 Our goal is to help you enjoy the sport of cross country skiing, whether you are a recreational or competitive skier. Stop by Glacier Cyclery & Nordic before your next ski day for a full line of wax & tune products, clothing and accessories to keep you warm and dry, plus the area’s largest selection of classic, skate and backcountry Nordic skis, boots and poles. Glacier Cyclery & Nordic’s staff is comprised of all types of skiers (from a certified PSIA instructor, to the weekender who pulls the kiddos in a sled on trails in Glacier Park for fun). Individually and collectively, we have decades of exploring Northwest Montana winters on skis. Whether you want to ski the local Nordic groomed areas, Glacier Park, or national forest trails, Glacier Cyclery & Nordic can help you put together a perfect day of winter adventure. Stop by for free trail maps and current trail condition reports! One mile from Glacier Cyclery & Nordic on Hwy 93. You’ll find no better views of Big Mountain, as this is a 36-hole golf course during the summer offering epic vistas. 14K of trails groomed daily, with flat beginner loops to rolling hills that challenge even the advanced skier. Insider tip: several miles of the course are lit at night, making this the perfect evening activity. Afterward, warm up in the restaurant or lodge with a hot drink and fireside seat. Trail fee $10. Dog-friendly trails in Flathead National Forest. Located approx. 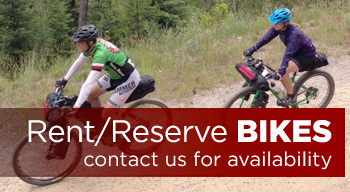 10 miles north of Whitefish with 12K of beginner to advanced terrain through beautiful forests with occasional open views. Groomed weekly so expect variable conditions, perfect for wider classic skis or experienced skate skiers. No trail fee. It doesn’t get much better than this! Trails are not groomed so bring your wider skis (or rent from Glacier Cyclery & Nordic) for a day of once-in-a-lifetime winter scenery. Accessed easily through the West Glacier entrance, the most popular ski route begins by parking at Lake McDonald Lodge and skiing the road toward Avalanche, offering gentle terrain, ample snow and the opportunity to visit waterfalls and ancient cedar groves. No trail fee but park pass required. With new trailhead access in 2017 off Big Mountain Road, this 23K area is higher in elevation than many of the Nordic areas in the Valley, so typically the snow is deep and soft. After the first few kilometers, you can ski either up toward the Whitefish Mountain Resort and more advanced Nordic loops, or gently descend into the beautiful forested area known by locals as Haskill Basin. Glacier Nordic Club grooms daily by 9:30am, no trail fee required but purchased a Glacier Nordic Club day pass helps to ensure continued daily grooming in this area. Dogs allowed on leash from the main trailhead, then off-leash on the lower trails. No dogs allowed on the upper trails toward WMR. When the snow gets thin in the lower elevations, a short drive to Blacktail Nordic trails typically pays off with substantially more snow and about 24K of trails that are groomed daily. The main trail gently climbs for several miles; turn around and enjoy a fun mix of downhill and flat cruising to the car. No trail fee and dogs are welcome! They should rename it “Winter Wonderland,” because the Essex area tends to receive more snowfall than any other Nordic system in the area. Located on Hwy 2 south of Glacier National Park, it’s about a 1.5 hour drive from Whitefish, so consider it a daytrip or overnight getaway that is well worth the time it takes to get there. Up to 33K of trails (groomed daily) through old-growth forest with views of Glacier Park, Middle Fork River and meandering Essex Creek. Trail fee $10, or included with lodging. Over 6 kilometers of flat to gently rolling terrain near Echo Lake are groomed 5 days per week, Monday, Wednesday, Friday, Saturday and Sunday. Please leave the dogs at home. Skiers using Bigfork Community Nordic Center are required to have a valid Montana Recreational Use License.